Fink formed shortly before the Civil War when the family of Fred Fink and others moved into the area from their former home in Mississippi. 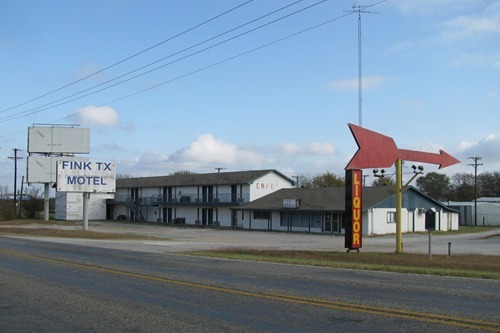 The community was underdeveloped until after the war when all of NE Texas was infused with new settlers looking to start fresh with cheap Texas land. Fink had a post office from 1897 to 1903 but the population never came close to a hundred. It declined to less than 20 during The Great Depression and averaged little more than that for the remainder of the 20th century. It is now what is known as "a dispersed rural community." 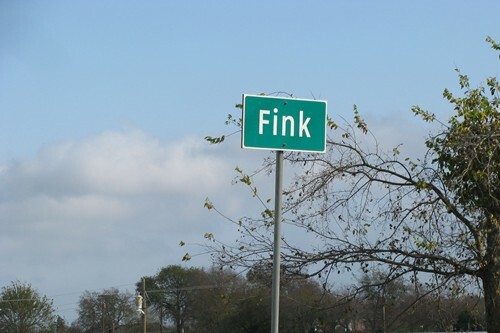 The fourth Friday in June has been declared Fink Day in Texas, by the Texas Legislature (people who are familiar with the name). This coincides with "National Fink Week" which is a celebration held by families sharing that same surname. 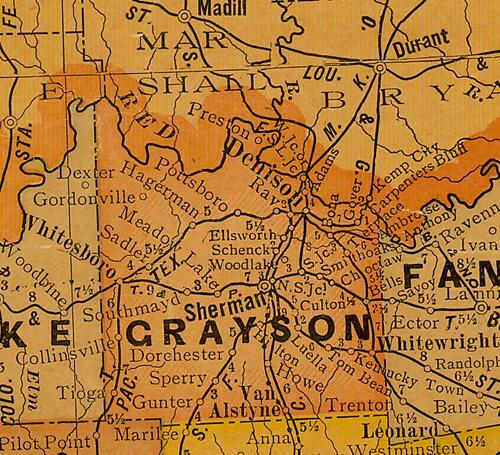 Fink barely appears on county maps, but due perhaps to its semi-humorous name, it appears clearly on the Official State Highway map - just below the Red River in Grayson County. 19th Century Mississippi Keelboat operator Mike Fink - once featured in the Walt Disney Davy Crockett series of the 1950s - was a real person with a reputation for heavy drinking and carousing. One of the stories about Fink places him in a shooting match with his best friend. The two were also rivals for the attention of one particular woman and this supposedly non-lethal "duel" had the men shooting targets off of each other's head - winner would get the girl. When it was Mike's turn he perforated his friend's forehead. Onlookers never knew if it was "shooting under the influence" or an intentional and very abrupt end to the rivalry. Some say that Fink himself, never knew. A "Fink" came to mean someone who was capable of betraying his best friend, although the years have softened it a bit to that of a informer or snitch. As a verb - to "Fink" on someone was a petty betrayal for little reward. It became a popular "friendly insult" in the 1960s. The term of rat - for informer was added in some circles - making the term rat-fink which is somewhat redundant. Subject: A law passed in the 70's. I remember working at West Publishing in the 70's up in St. Paul and my editor and I published the Texas Statute laws. We came across a law that honored the people of your city as a bunch of Finks and it was hilarious. It brought back to mind that even our law makers have a sense of humor. Also too, in 1977, Jesse James was the state treasurer.